Welcome to Windsor Canoe Club . . . The club has been in existence for more than 50 years. Based on the banks of the River Thames in Windsor, Berkshire, the club house offers a club fleet of various general purpose, slalom and racing kayaks; club room; male and female changing and showering facilities; training area and refreshments. Hot food and snacks are available on club nights, with hot drink making facilities available 24/7. 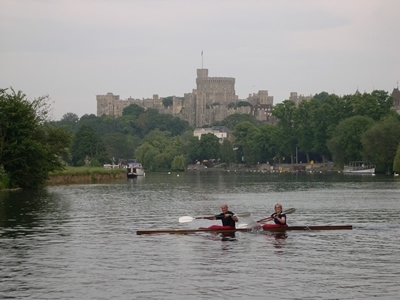 The River Thames is a superb location on which to learn to canoe, train or participate in recreational activities. The club-house is accessible to suitably experienced club-members 365 days a year, and “Club night” is Wednesday night from about 6:30 p.m.
Limited indoor boat storage for members’ kayaks is sometimes available. There is a long waiting list.